Here is step-by-step write up. As background, I have a 1998 BMW M3 with 90K miles. The leather interior was in reasonably good condition (no cracks or breaks in the leather itself) but, had moderate wear in spots (where the dye had been worn away) and generally looking dingy. Because the leather was in reasonably good condition, I choose not to spray or brush the dye on. By using the wipe-dye technique I was able to control the amount of dye applied and did not have to worry about overspray. The wipe dye technique allows you to really control the application. However, I did use masking tape just as added protection where the vinyl trim meets the leather and on the BMW "M" tri-color stripe. I had originally planned on doing this project in the summer but, could never get a window weather with low enough humidity. Then, during Christmas break this year I realized my basement remained a constant 70 degrees with 30%-40% humidity. So, after consulting my Bentley Workshop Manual, I had the entire front and rear seat assemblies removed and in by basement with in 45 minutes (far easier than I realized). I do think this was key since the basement had the right conditions and gave me great room to work. 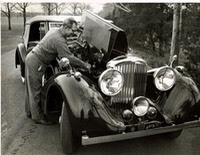 The entire project required about 10 days so I was fortunate to have a third car I could drive while the BMW was out of service. (Incidentally, I had a local upholstery shop replace the seat heating pad in the driver's seat which had previously failed - I had this done before I started the dye project). Just so you know, I had done a full treatment of Leatherique Rejuvinator and Pristine Clean about 6 months earlier. I also had top quality synthetic acrylic (artificial bristle) artist’s brushes (various sizes for edges) and 600 &1000 grit sandpaper on-hand in case I needed them but, ultimately did not. 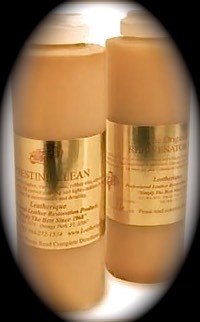 Apply Rejuvinator Oil liberally to leather and vinyl surfaces. I wore latex gloves and used the paper towels to work it into the leather. Use masking tape to protect any vinyl trim from excess dye application. Immediately pour a small amount of dye into a shallow dish/ bowl so dye and pigment won’t settle out when dipping paper towel. I used a large rectangular (3"x6")Tupperware bowl and poured only enough to fill the bowl with a few millimeters of dye. Be sure surface is clean and dust free. Start in a small, inconspicuous area to get the feel. Make the Towel into a "Powder Puff" NO edges allowed. Touch the "PUFF" into the bowel of dye (you want a little not a big BLOB). WIPE the towel wet with dye on the surface in a circular motion using moderate pressure. NO BACK AND FORTH PLEASE - that will cause streaking! This is not particularly hard but, I did proceed slowly and with care. Relax and in 20 minutes your project should be dry. Multiple thin coats is the preferred method. The first coat may not look great. Once you have 2 or 3 coats on, then the color will look more even. Look at the project need for dye, more than likely if you did it correct the first time, then repeat dye application as required till you are done. Several thin coats look more natural than one thick coat. If more than 2 coats necessary, allow over night to dry before any additional coats. If you had the gloves on all you have to do is dispose of the towel and gloves, pour the dye back in the bottle, put the lid on and store in a dry location out of the sun for future touch up. I must admit, the results completely exceeded my expectations. As the before and after photos show the seats look virtually new. The color match was phenomenal as well. The actual time spent working was very little. I did a little each evening. Most of time over the ten days was the dry-time between applications.